Summer is finally almost here and the weather has been perfect for swimming. Whether you are headed to the pool or out to the beach this summer, these soft silicone ear plugs are perfect for protecting your kids’ ears from the water. 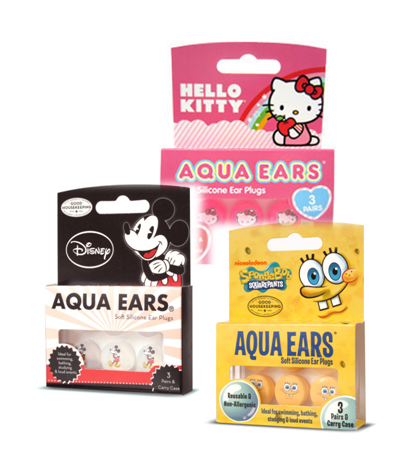 AquaEars are soft silicone pieces that are slightly sticky and are completely moldable to any size ear. They are reusable (until they’re stickiness is gone) and are also non-allergenic. They are recommended for children ages 3 and up, and can actually fit smaller adult ears as well. AquaEars have options for both boys and girls, and some of their cute cartoon line includes Hello Kitty, Sponge Bob, Dora the Expolrer, The Little Mermaid, Cars and Finding Nemo. AquaEars can also be used for bath time for kids with sensitive ears or infection-prone ears. They are also really great for studying or at events where the noise is a bit too loud for the kiddos. They have a noise reduction rating of 22 decibels, which is toward the higher end of the effectiveness scale of zero to thirty. I received AquaEars for my kids to review and let me just say these little ear plugs are simply amazing! My daughter has always had very sensitive ears and because her ears are tiny, it’s is super-hard to actually find ear plugs that fit, are comfortable, and actually work for her. After trying out the ear plugs in her ears during a day at out at the pool, I’m convinced that every kid with ear problems needs these. These plugs are like a flat round piece of moldable silicone, so you just place them in front of the ear canal and gently press until you fill them covering your ear canal. You will also feel a bit of pressure as they expand making an airtight seal but they don’t ever actually enter your ear canal, so they’re really comfortable to wear. Normally at the pool, we are constantly adjusting her ear plugs or putting them back in because they have fallen out, but that was definitely not the case with AquaEars. In fact, the AquaEars actually stayed put until we were ready to remove them. It was a really nice change. My daughter has even commented several times on how much better they work and how much more comfortable they are then the ones she has tried in the past. I have also tried them in my ears and they work really well for me also. They fit and they’re super-comfortable, and I absolutely love the fact they just mold to your ear and don’t actually go in your ear. They’re really perfect for the whole family and they’re definitely a must-have in my summer beach bag. AquaEars come inside of a handy carrying case that is the perfect size for your beach bag or even a pocket. AquaEars are available in two different sizes (Ages 3-11 and Ages 12 and up) for around $4 at CVS and Walmart. Disclosure: I was not paid to write this review. I did receive products free of charge to facilitate my review. All opinions in this post are honest and are my own.